Firing up the energy and building momentum in the live auction can have a big impact on this most-lucrative portion of your event. The energy and fast pace engage bidders, and soon more and more guests are robustly bidding and having fun, which ultimately means more money raised at the event. How do you get the momentum going? First and foremost, you must start with a fun and highly desirable item that gets everyone’s notice. It’s best to kick off the live auction with an item that is something almost anyone would want to bid on. But it is important that this item, though highly desirable, be at a lower price point than the remaining items in your live auction. Why? Because this first item provides a great warm up for everyone. Guests will see how the bidding works and are likely to jump in when they feel more comfortable. The auctioneer has to get familiar with the crowd too, so it allows him or her to get ready for the larger-valued items coming down the road. You can make it fun too! Auction something that will turn heads, like a glass of water or a simple dollar bill. 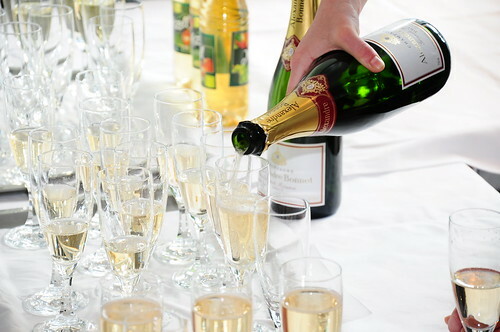 Many events successfully start their live auctions by auctioning a great bottle of chilled champagne. It needs to be a nice bottle, like a Veuve Clicquot Brut, which ranges in price from $35-$60. You could go all out and open with a bottle of Dom Perignon at $150+, but it is really not necessary for this first auction item. Consider having someone underwrite the cost of the bottle, and in exchange, offer a mention of the underwriter/donor by the auctioneer. The venue will certainly let you borrow champagne flutes, but some organizations have event-specific specially made with their logo. The auction is for the champagne and flutes that guests can take home as a souvenir. You should create much fanfare around this bottle. Have a wine steward ready to serve it to the winner. Play it up. Typically, the bidder will be bidding on champagne for their table, so it might be nice to offer two bottles as the first item, for a table of 8 to 10 guests. A note of warning, the other guests at the table might want to pitch in, but let them do this on their own at the table and just have a single buyer at auction checkout. Otherwise, it gets too complicated. Once sold, create a lot of fanfare. Serve it on a silver tray with the white cloth draped over the server’s arm and immediately deliver it to the table. A nice thing to do at an event is to have a secret second champagne service that can go to the second highest bidder. You can give them the option to buy it at their bid price. It creates goodwill and fun and generates more revenue for your fundraiser. In general, the first auction item is not publicized. It is more of a surprise and as such, is normally left out of the printed program. If your first item is champagne, make sure it is chilled for several hours prior to the event, and ready to serve in glass flutes. You can purchase the champagne, or your venue might provide it for you either as a donation or as part of the cost of your event. Some people put other items with the champagne, like chocolates or a special hors d’oeuvres, or a swag item. Have fun with it and include enough for the whole table. Check with the venue regarding their liquor license, and be sure to adhere to your state’s particular liquor laws. If your event is held at a venue that holds a liquor license, you may have to obtain the champagne directly from the hotel. I LOVE to hear the “POP” as the champagne is opened. Make a production out of it, but allow the auction to continue immediately on. Remember, the reason for offering this item in the first place is to establish momentum. Depending on your guests, this item can raise a lot of money on its own. I’ve sold it for as little as $200 and as high as $3,600 — and I sold it twice at that price! And remember, make every minute a revenue generating minute!